My first prints were an extremely good learning experience. Some of them went flawlessly, others had quite a few issues. The translucent pla was already setup in the machine so I chose to use it for my test prints. 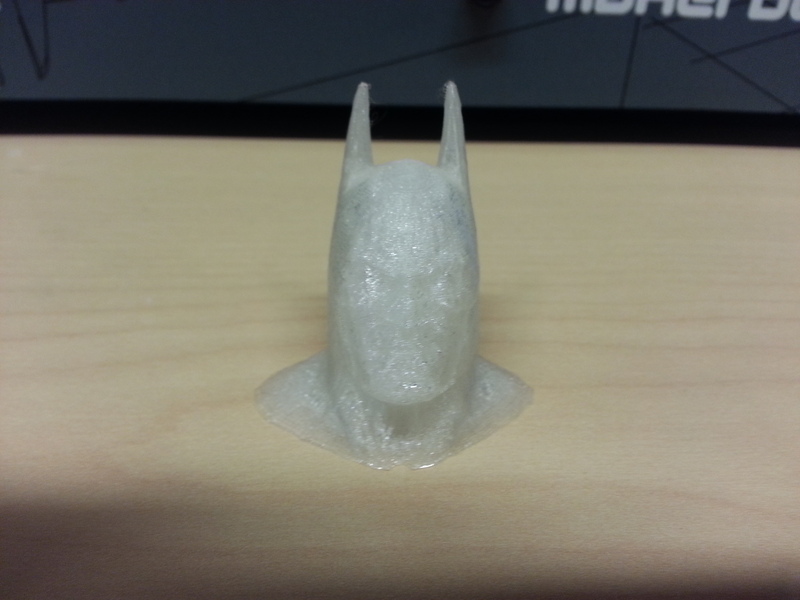 I downloaded 2 stl files from http://www.thingiverse.com/, one for a desktop cell phone holder, and one of batman. My favorite by far is the batman head which came out perfect. The cell phone holder curled a little during the printing process and so the sides came out a little messy. We think that the translucent pla might be cooling too fast or have more shrink to it because the projects have had a tendency to curl up off the platform while using it. Sometimes we’ve seen the plastic goop up a bit too. Either way, Batman came out pretty cool. ← Yeah, I made that.